It’s no secret I have a thing for Mexican food. We eat it in some form at least twice a week, and I have countless recipes on the blog for tacos, beans, salads, enchiladas, and nachos on the blog. You’re smart – you can see a pattern. Another favorite? The burrito bowl. It’s the first thing I crave when we come home from a long trip. 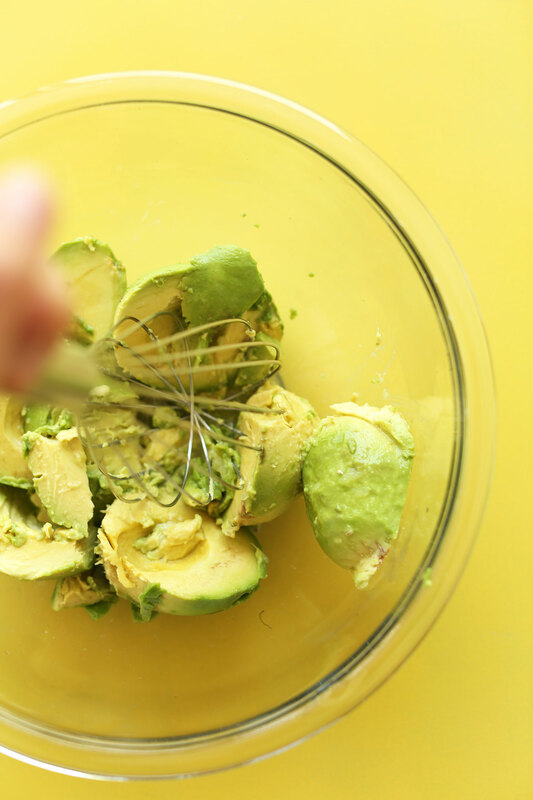 It’s fast, easy, healthy, delicious. 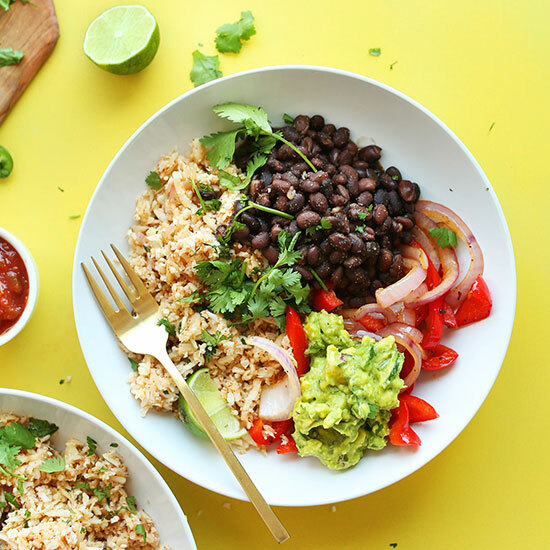 The base is cauliflower rice, which gets steamed slightly on the stovetop and then packed with flavor thanks to salsa, cilantro, lime juice, and spices. I could eat that for lunch on its own, but wait, there’s more. Guacamole is optional, but the black beans and sautéed peppers and onions are not. This pairing adds plenty of plant-based protein and fiber, vitamins and minerals, and not to mention tons of flavor. Yes, please. This would make the perfect meal when you want something substantial but healthy on the table fast (story of my life). It’s delicious on its own, but is only elevated when served with fresh corn tortillas or all the chips. It’s your life and I’m not going to tell you what to do, but this + chips = life. If you try this recipe, let us know! Leave a comment, rate it, and don’t forget to tag a picture #minimalistbaker on Instagram so we can see! 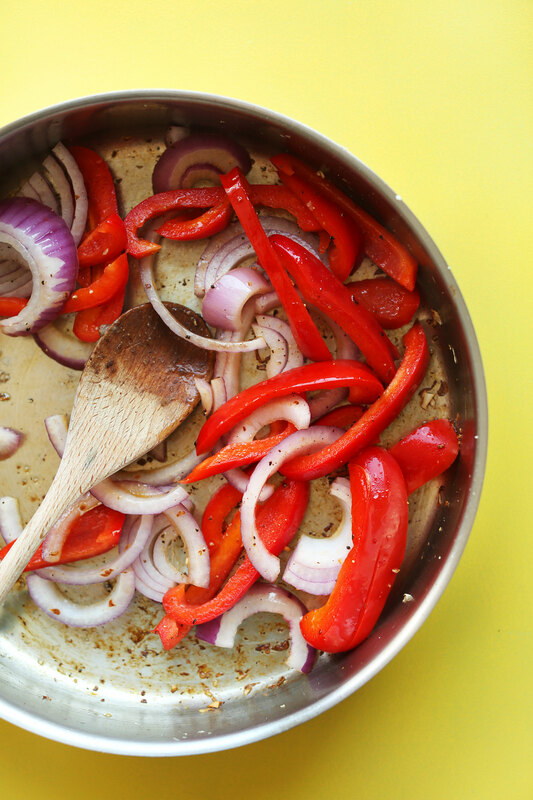 We love seeing our recipes come to life in your kitchens. Cheers, friends! Note: We are hosting an event at Watermark Books in Wichita, KS this Thursday, July 7th at 6pm! Swing by, sample some cookbook recipes, let us sign your book, and give us a hug. It’ll be so much fun. Also, be sure to check out all of our upcoming events here! How do you adapt this with frozen cauliflower rice? I’d recommend preparing the frozen cauliflower according to the directions on package, and then hop to step 5! This was a wonderful recipe that the whole family enjoyed! Woot woot! Glad to hear it, Julie! I love to cook rice and add raw zuccinni for last 10 minutes of cook time , then add shrimp for last five minutes ,(pluss seasonings, ie: garlic, crushed red pepper, italian herbs), what would be the best way to sub cauliflower to maintain same texture? I was looking for a recipe to go with what I had on hand and this was the closest thing so I gave it a try. It was delicious!! I didn’t have any cauliflower so I used tri-color quinoa instead. I also had some grape tomatoes that needed using up so I added them to the quinoa as well. I served it with homemade guacamole and it was fabulous!! The blend of seasonings worked really well and my family ate it up!! I am looking forward to making this with the cauliflower, it’s a GREAT idea!! So this is my new favorite thing! So delicious and healthy. 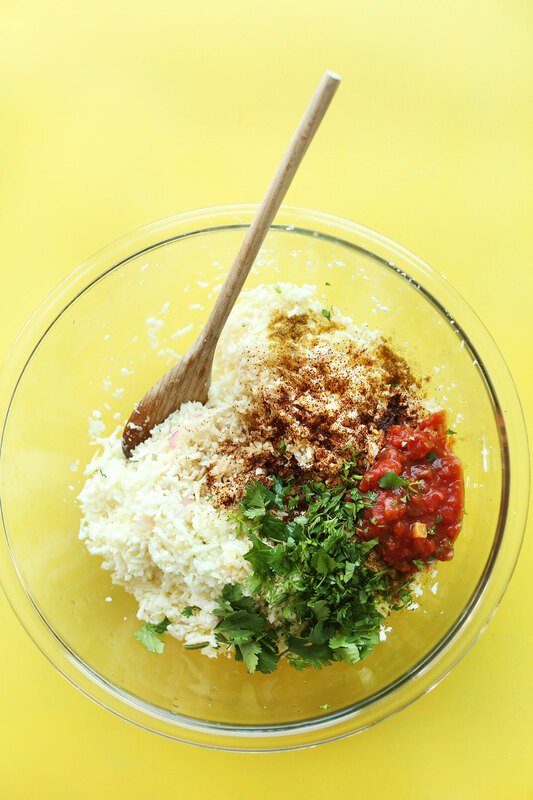 How do you do this if using frozen cauliflower rice? Sooooooo delicious!!! Made this tonight!!! This is the 6th recipe I’ve made of yours in the last 8 days!!! Each one has been superb with amazing flavor profiles!!! Who knew vegan food could taste so good???? My whole family (only 2 of us are vegan, one is vegetarian, and two are meat eaters) loves every meal I’ve made!!! Thank you soooo much!!!! I was getting bored cooking lately as a relatively new vegan-though vegetarian for 4 years. I am so inspired to cook again!!!! Thank YOU!!!! This was my first time trying anything with cauliflower rice, and this was a very rewarding first experience! The grating was a little annoying, but that’s more because I hate grating things than anything else. ;) This was really tasty and very easy to make, I will be recommending this to a lot of people! Brilliant!!! Simple and yet so good. I started from scratch witht the black beans and it was very flavourful. Thank you!! This was just what I wanted!! So good and very guilt free. Thank you! I have never left a review for a recipe I’ve found online before, but this was amazing. So flavorful and so healthy. Fantastic! Will definitely be an often repeat in our house. Thank you so much! This was a delicious meal all on it’s own…we added baked chicken. Delish and satisfying after an all day hike. Easy to make. Had all the ingredients in the fridge. Thank you for putting it together in a yummy way! I’m eating this right now and I like… will have exercise powerful self-control to not eat the rest tonight. It’s awesome. Thanks for your amazing recipes!! This was such a delicious and versatile dish! I made it 2x this week and everyone who tried it…LOVED IT! I just added flax tortilla chips (Trader Joes), poured salsa over it and made Laura Miller’s recipe for “Vegan Taco Meat” and it came out phenomenal! YES! Thank you, Dana! 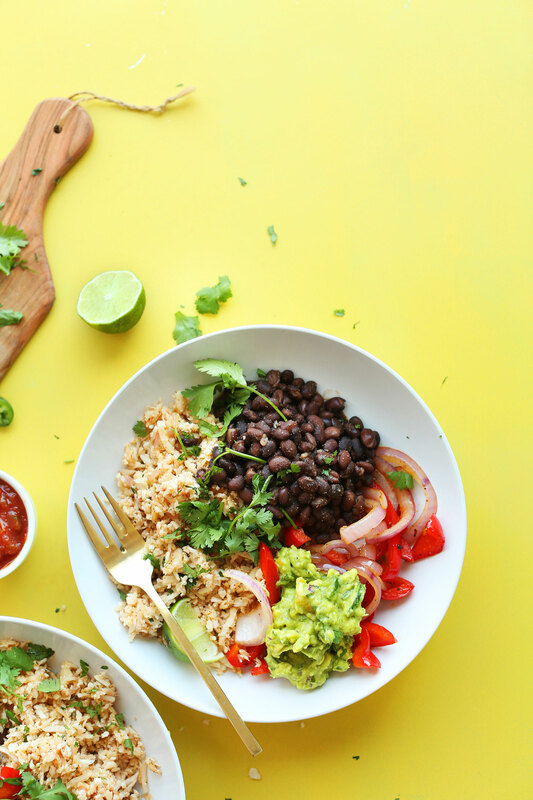 A delicious burrito bowl without all the rice! It’s a new house favorite. And – what? – Trader Joe’s has bags of already riced cauliflower to make my life easier? Really good stuff. Yum. I made this for dinner tonight. It turned out great. It was the first cauliflower rice recipe I’ve made – and the first minimalist baker recipe as well. Your site is such a gift. Thank-you for sharing! The cauliflower did take a while to grate, but I’d say it’s worth the effort. This dish is delicious! I think you’re slowly turning our family vegan. I used my food processor… it comes out perfectly. The blade and grater at the same time. I LOVE cauliflower, so when I saw “Cauliflower” my heart instantly became happy. Haha! I’m excited to try this bowl out. This recipe is amazing! It’s easy to make, super flavorful, and surprisingly very filling. This will be a go to recipe for my husband and I on nights we don’t feel like spending a lot of time cooking! I made this last night, but it took me 45 minutes just to grate all the cauliflower and let it dry! However, we were so pleasantly surprised by the taste and texture! Because we are not Vegan, I added shredded chicken and wrapped it all up in a tortilla for my husband. It was more like a fajita than a burrito. I put mine in a bowl and added a little sour cream. I was full and satisfied! I’m not a huge fan of salsa. I wonder if green salsa would be better. My boyfriend refuses to get on the cauliflower rice bandwagon. Can I use regular rice or quinoa instead of cauliflower rice? How would I modify the recipe/directions to do so? This was absolutely delicious! Especially the cauliflower rice – I’m now a believer! This was the first time we’ve tried cauliflower rice. It was so good! And it came together so quickly! We thought it went excellently with guacamole and prickly pear margaritas. We used red salsa for the rice, but next time I think we’ll try a green salsa, because I think that would make a great contrast with the beans. Thanks for the delicious, quick dinner idea! Your love for Mexican food equates to my love for Indian and Thai food! I have them twice a week as well–even three times if I’m crazy, which ultimately I am, but anyways, I believe it’s a lot cheaper and healthier to make your own recipes at home. 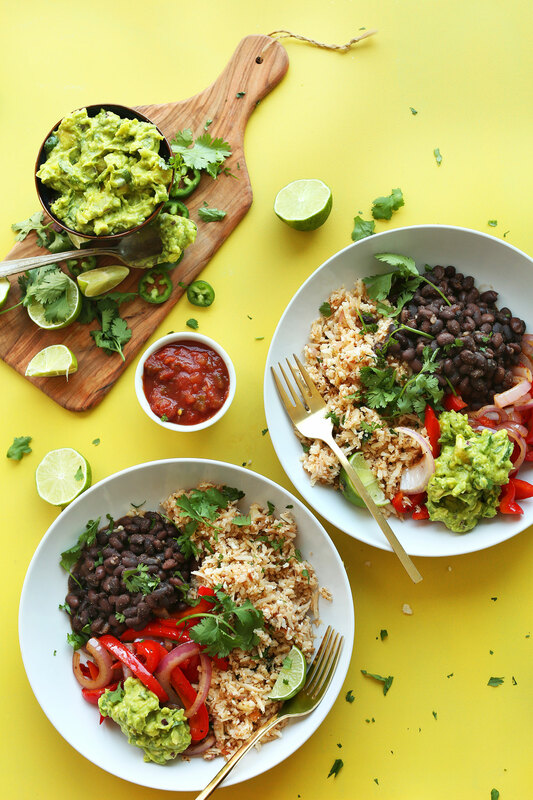 So I am totally with you on the bowl wagon–I can make curry bowls, sushi bowls, burrito bowls, macrobowls and pretty much anything I wish at home! SO yummy! Dana I have been secretly following your brilliance for almost a year and every recipe that I have made has been fool proof. I really appreciate that these are so well thought through and have so much flavor. I have found that being Vegan & gluten free for three years normally my recipes have more flavor in them than most but not with yours. My family and friends have been enjoying a recent double batch of your No refined sugar GF turtle brownies!! Looking forward to trying the Cauliflower rice burrito bowl we don’t eat grains very often so its right up our alley. Keep inspiring!!! Best time of the year to eat cauliflower too! Do you drain the beans before you warm them up? I made these last night and they were AMAZING – thank you for the inspiration!! So the beans are not cooked in water? Just heated with spices? Oh my gosh this looks so yummy!! !